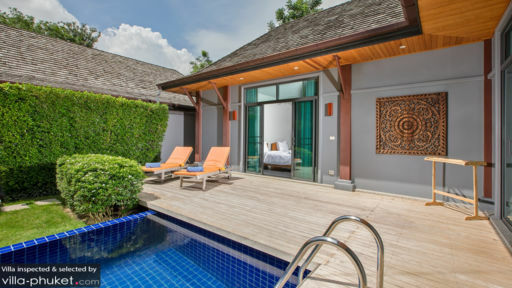 Set in a private compound five minutes’ drive from Nai Harn Beach, Villa Natuna is the perfect getaway for vacationers seeking to get plenty of sun, sand and sea during their stay in Phuket. 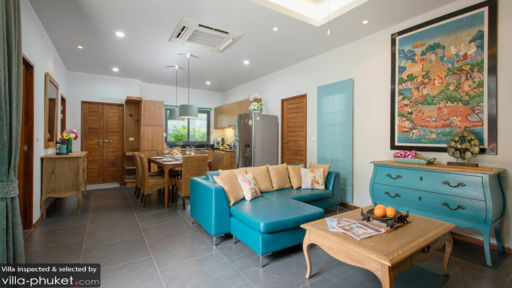 International restaurants are scattered all around the villa so dining out is accessible - although a team of housekeeping staff and a fully equipped kitchen makes dining in easy and convenient too. Three bedrooms sleep six guests, making Villa Natuna a great bet for small group retreats. Each of the bedroom facilitates rest and relaxation with its soothing colour scheme, air conditioner, ceiling fan, blockout curtains, plush king bed and modern amenities. Glass sliding doors allow ample sunlight to cascade in, and offer easy access to the outdoor compound and pool. All bedrooms are equipped with a private en suite. Soak up the zen vibes in Villa Natuna’s well-manicured garden. 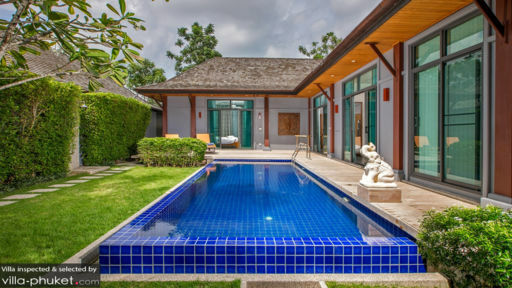 The rectangular pool takes center stage outdoors, and is the favourite hangout - particularly on hot afternoons, where a refreshing dip in the pool is always welcome. Recliners are laid out on the lounge for sun seekers, and outdoor chairs and tables can be set up at your request for poolside cocktails in the evening. A six seater dining set on the spacious deck is where vacationers enjoy al fresco meals. Cosy and airy, the living spaces are bathed in natural light thanks to the full length glass sliding doors. The colour scheme is pleasing to the eye, featuring a variety of neutral, earthy hues. Set in an open layout, the indoor lounge extends out to include a dining suite and open concept kitchen. Sofas, throw cushions and an LCD TV fill up the lounge, while a wooden dining set seats a party of six comfortably for meals enjoyed indoors. The kitchenette is chic and sleek with black countertops and white cabinets. As with all luxury properties, Villa Natuna enjoys impeccable housekeeping service and security services. Nai Harn’s tranquility makes it a popular destination among vacationers in bustling Phuket. From your villa, you’re just a five-minute ride to Nai Harn Beach, where calm waters and a swathe of powdery white sand await. The waters here are great for swimming from November to April. Between May to October, stronger currents are present, so care should be exercised. An array of restaurants and eateries line the coast, providing beach-goers with plentiful options for unwinding with sundowners. For snorkeling, head down further south to Ya Nui or Ao Sane (six minutes’ by car). Restaurants and local amenities are peppered all around your villa. Venues like La Terrazza Phuket Sunset Lounge Bar, Mahasamutr and dining establishments within the The Royal Phuket Yacht Club are about five minutes by car. Also located within the vicinity are supermarkets, food markets and bank branches. Families will enjoy exploring nearby attractions like Promthep Cape (15 minutes by car), known for its spectacular sunsets and Windmill Viewpoint (eight minutes by car), where uninterrupted views out to the sea are enjoyed. Balance out the peace and quiet of Nai Harn with a night out at bustling Patong Beach (35 minutes by car), where a vibrant nightlife scene awaits.